I have to start off by saying thank you to everyone for all the sweet comments from my Coastal Fall Home Tour last week. My heart is bursting at its seams with your kind words. 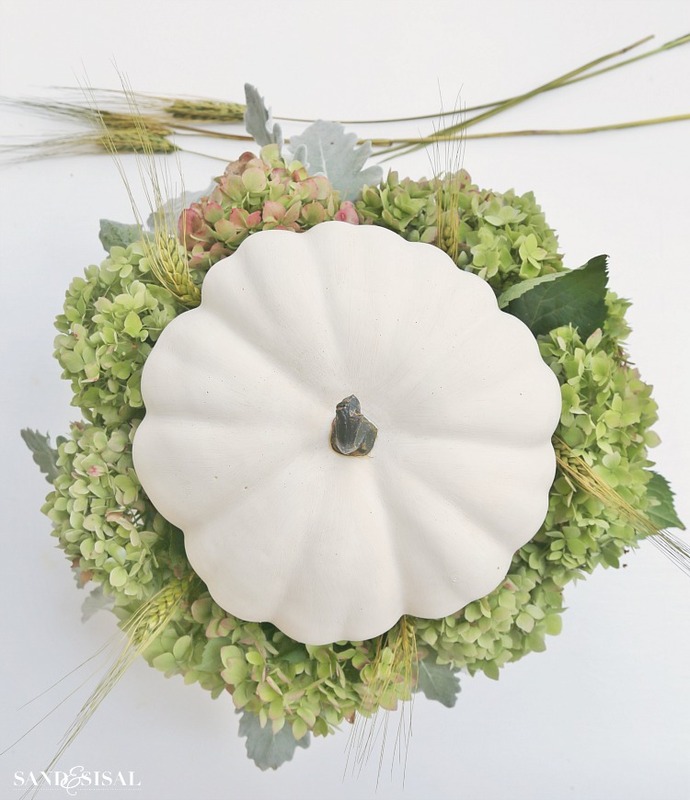 Many have asked for the demonstration how to make the White Pumpkin Fall Centerpiece and today I’ll walk you through the super simple steps. 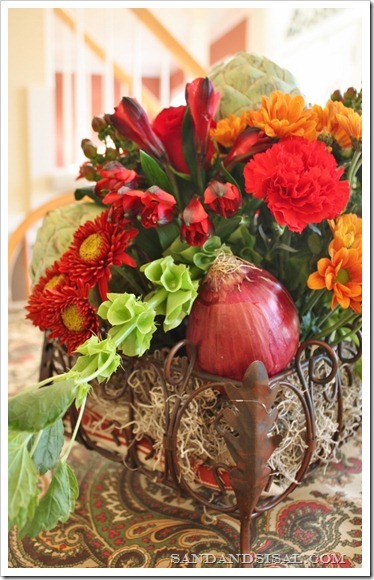 This fall centerpiece can be thrown together in just a few minutes and is a beautiful way to ease out of summer decor and into autumn. 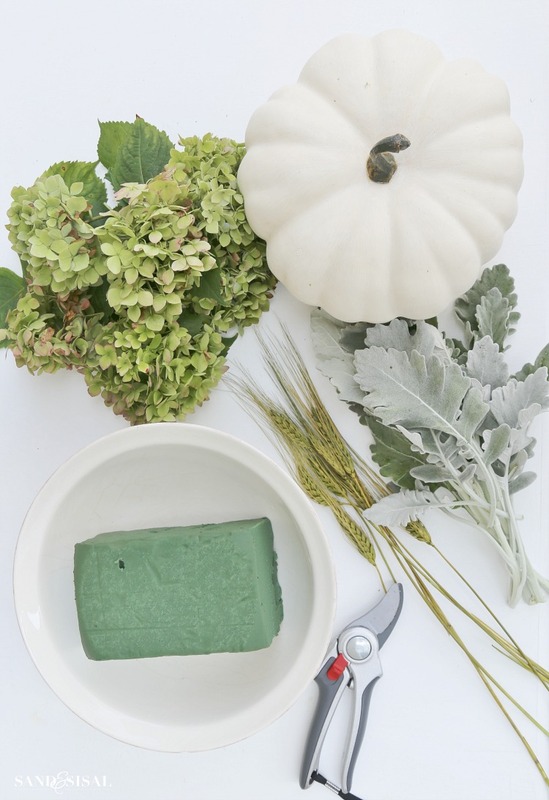 Step 1: Soak the oasis foam in water for a few minutes until the foam is completely wet, trim if needed and place in pedestal bowl. 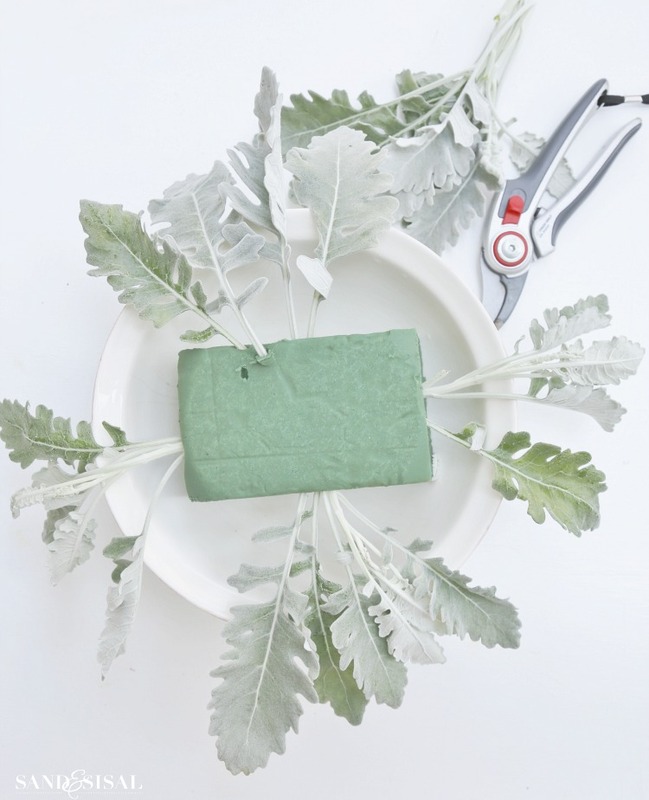 Cut Dusty Miller stems and insert into a few into each of the 4 the sides of the foam. Allow for the Dusty Miller to hang over the edges of the bowl. 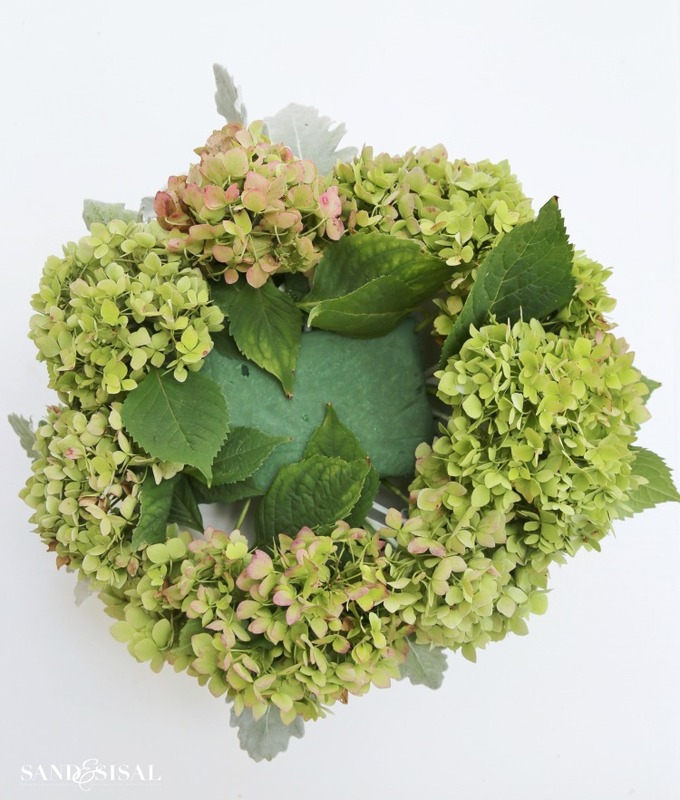 Step 2: Insert dried or fresh hydrangea blooms into the oasis foam, creating a ring of blooms along the edge of the bowl. Step 3: Place a plastic sandwich bag over the middle of the wet oasis. This is necessary to protect the bottom of the pumpkin (faux or real) from molding. It also helps retain the moisture level of the oasis foam. Step 4: Set the white pumpkin in the middle. Trim wheat stems to approximately 4-5 inches long and insert 5 into the oasis. Voila! 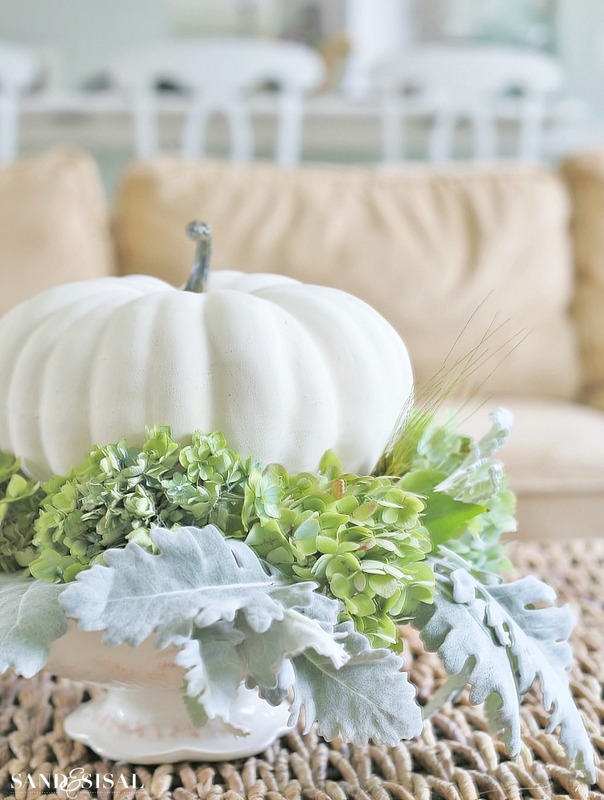 That’s all it takes to make a beautiful white pumpkin centerpiece! Be sure to check the moisture level of the oasis everyother day and add more water to the foam if needed. 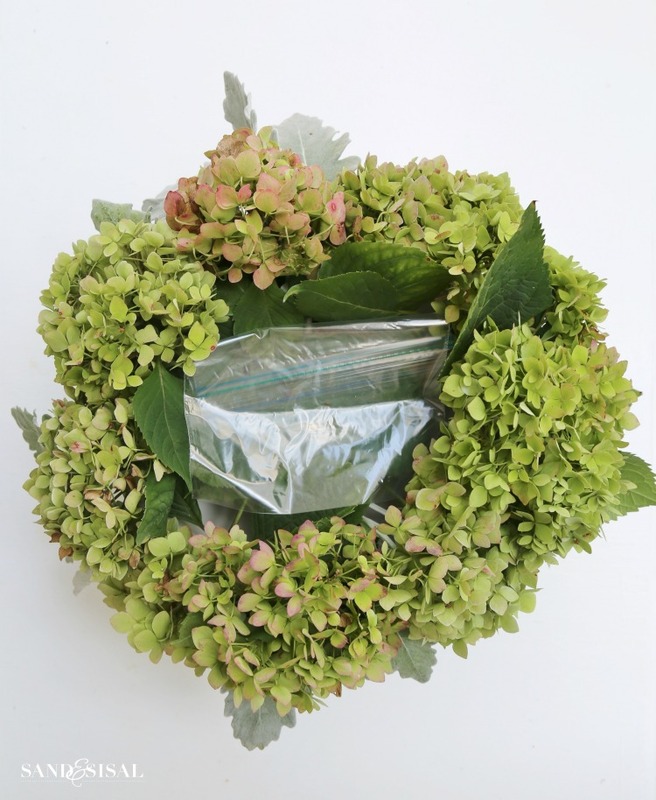 One thing which is nice if you are using fresh hydrangea blooms is that in about a week, the blooms will dry out and you have gorgeous dried blooms to use in other arrangements and crafts. Lots of pretties and great ideas, love them all. You have gorgeous home, at least your living room, from photos. Love your huge windows. 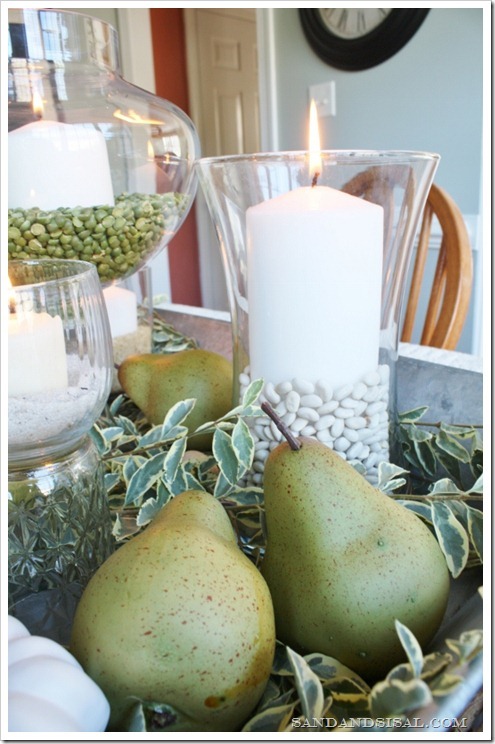 Do you use live dusty miller stalks or faux? Anymore fax greenery is made to look very real. Your arrangement is just so pretty. Love the arrangement and I am going to make it. Although, I am going to use silk flowers so I can keep it extra long. Your seagrass coffee table is lovely. Is it a recent purchase or have you had it a while? If recent, would you mind sharing where you purchased it from? Thanks. 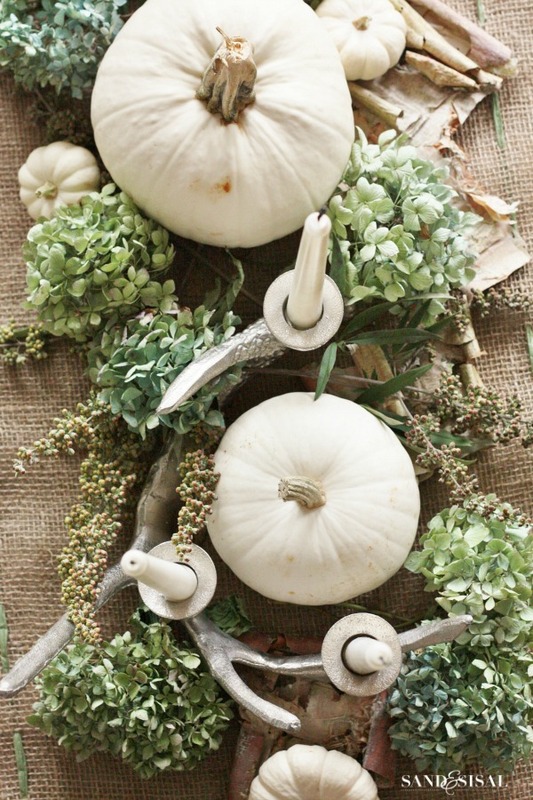 I’m wanting to make a white pumpkin centerpiece, I love yours. Your living room is lovely, the sea grass sofa table really caught my eye!❤️ You have done a beautiful job decorating throughout your home.